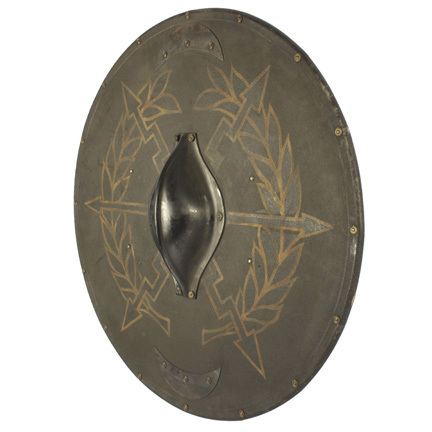 This prop shield was used by one of the Praetorian Cavalry background characters in the 2000 motion picture “Gladiator” starring Russell Crowe. 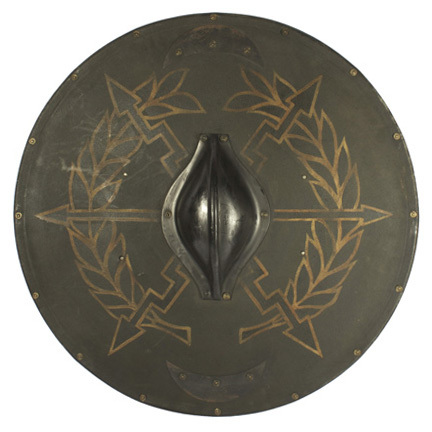 The round shield measures approx. 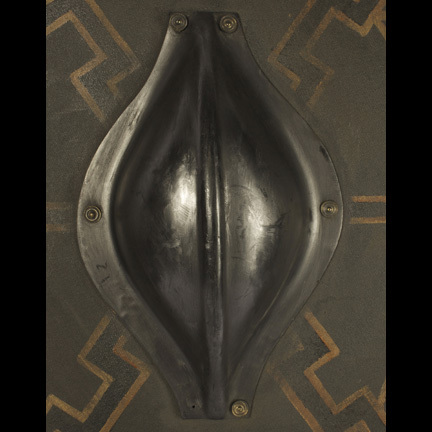 29” in diameter is constructed of a round wooden panel covered with black and gold painted canvas. 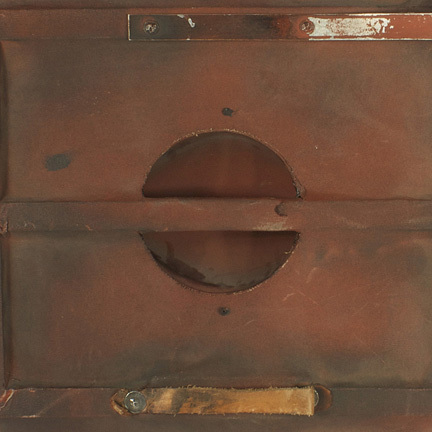 The front is decorated with a laurel and arrow motif and has metal crescents, a plastic boss in the center, and rivets around the outer edge. 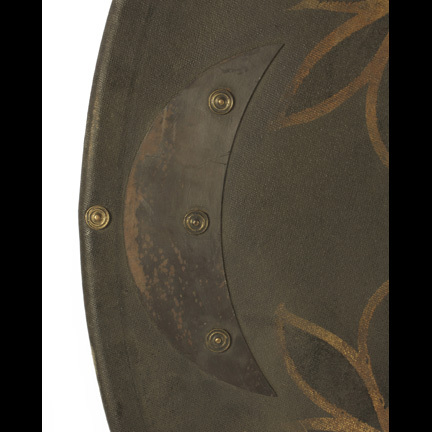 The back of the shield is painted red and has a leather handle on one side, metal bar on the other, and additional handle in the center. 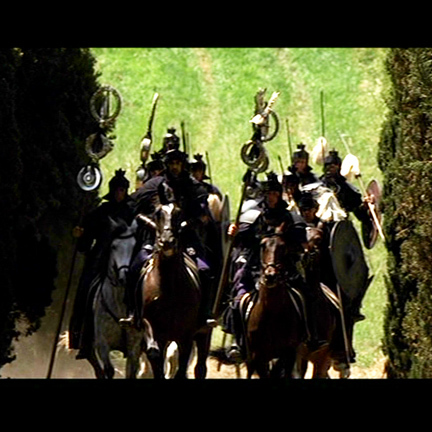 These shields were used by the Praetorian Roman Cavalry characters in several key scenes of the film. 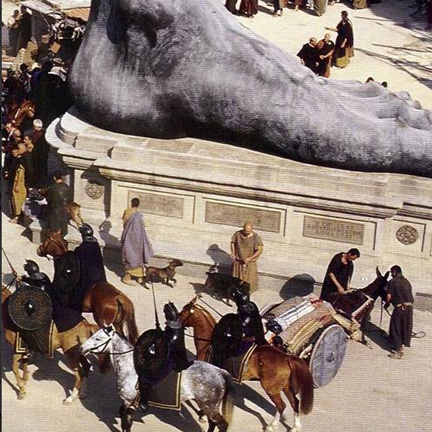 They appeared notably during the sequence when the Roman Cavalry ransack the home of “General Maximus” (Crowe) and murder his family, and also in several scenes when Maximus and his fellow gladiators enter Rome to complete in games at the Coliseum. 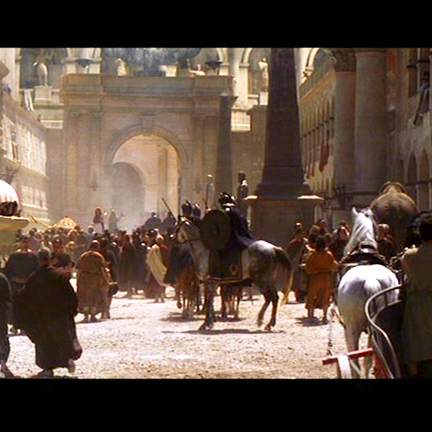 Ridley Scott’s “Gladiator” received five Academy Awards in 2001, including Best Picture, Best Costume Design, Best Sound, Best Visual Effects, and Best Actor in a Leading Role to Russell Crowe for his outstanding performance in the film. 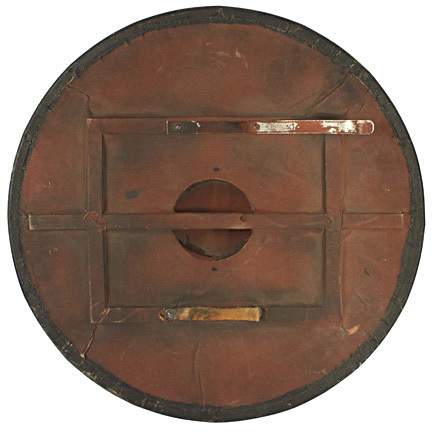 The shield is in distressed screen used condition with evidence of wear from it use in action sequences. Presented by The Golden Closet, your premier source for iconic screen used wardrobe, props, and collectible music entertainment memorabilia.